In 2010 David Platt rocked the American church with the publication of his highly acclaimed—and highly critiqued—work Radical: Taking Back Your Faith From the American Dream. (Read our review here.) Radical called on Americans to spend less effort chasing the entrapments of materialism and instead offer their lives whole-heartedly in service of God. In the ensuing months many influential leaders praised his efforts, but Platt was also met with a fair amount of criticism. It is a fair assumption that Platt’s newest work, Radical Together: Unleashing the People of God for the Purpose of God is designed to be an answer to some of those critiques. Throughout the history of the Church one of the more controversial and confusing issues has been the interaction of grace and works. It is no wonder that so much of the New Testament is devoted to these two themes. So it is not hard to understand why Platt’s entrance into the foray of this debate stirred up some heated dialogue. In Radical Together Platt clarifies his position by reiterating the importance of grace. In a candid confession, he laments the fact that his passion for an active faith sometimes has prevented him from adequately emphasizing the centrality of grace, not works, in the Christian faith (Pg. 38). That being said, Platt is very firm in his resolve that grace in our hearts should extend to goodness in our hands (Pg. 16). Another theme from this work that should resonate with many Americans is the importance of every individual. Platt contends that far too often the American church has viewed evangelism, discipleship, and ministry as things for professional ministers, not something for everyone who claims the name of Jesus. Instead, we need to recognize that the Church is to equip believers to do ministry, not to leave all the heavy lifting for professionals. Platt draws our attention to the importance of every believer making disciples, who then go out and make disciples, who make disciples (Pg. 68). The theme of disciple making is the golden thread that runs throughout all of Platt’s work, and is also a helpful clarification of his earlier book. Many felt that the first Radical book drew too much attention to the works aspect of Christianity, some even going as far as to decry it as a revamp of the early 20th Century Social Gospel movement. 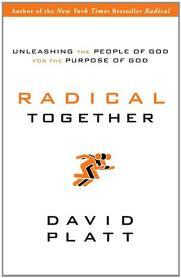 In Radical Together Platt is crystal clear on the necessity of our actions being Gospel and evangelism centered. An extended portion of the book is devoted to the importance of evangelizing the thousands of remaining unreached people groups in the world (Pgs. 84-86). One of Platt’s passions is getting American churches to invest more overseas (he points out that most American churches channel 2% of their budget to overseas missions efforts), but he is clear that it is not just that we need to engage in issues of social justice, but rather in actively spreading the Gospel through our actions. Many will critique Radical Together for some of its theological assumptions. Platt’s eschatology centers on the notion of the second coming of Christ occurring after the whole world has been evangelized (Pg. 83), and he repeatedly asserts that our own actions can thwart the purposes of God in the world (Pgs. 8, 26). But overall David Platt deserves a great deal of respect for having the courage to take on some of the materialistic assumptions of the American church. It will always be easier to sit back and debate the theological underpinnings of the Church’s involvement in the world than to actually get in the trenches. Even if someone can’t agree with the conclusions that Platt draws, Radical Together will at least encourage them to reevaluate their own efforts to fulfill the Great Commission.